Good for the Environment, Bad for Termites. Timberlink Blue is Australian-made structural framing. Made from plantation pine, Timberlink Blue has been treated to provide protection from termite and European House Borer (EHB) attack. It is the lightweight, cost-effective, environmentally sensitive solution for building house frames in termite and EHB affected areas. Protects buildings from termites (including West Indian Drywood termite) and European House Borers (EHB). Manufactured in Australia from renewable Australian plantation pine. Treated to an H2F level for use in internal, above ground framing applications. Suitable for use below the Tropic of Capricorn. Your local council will advise if you are building in a termite or EHB zone, in which case you will need to comply with NCC termite management requirements. Highly effective yet safe for you and your pets. Where a design compliant with AS1720.1:2010 specifies the use of F7 material, Timberlink MGP10 can be substituted. 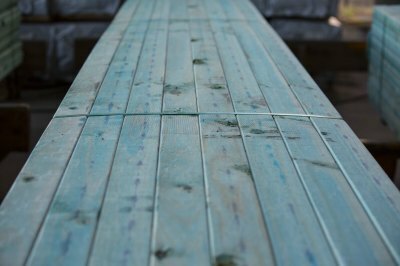 Lightweight, with a high strength to weight ratio, Timberlink Blue is easy to transport and move around a building site. Timberlink guarantees the product for twenty-five years. Note: All sizes may not be available in all grades. Please contact us to confirm availability in your state. Regular metal fixings can be used, as Timberlink Blue is not corrosive. Resealing on cut ends, holes and notches is not required if used within a termite treated enclosed frame. Timberlink Blue should not, however, be rip sawn, dressed or planed to reduced dimensions. Prior to use, keep exposure to weather to a minimum. Keep packs wrapped, strapped and clear off the ground. When handling and cutting any timber products it is advisable to wear dust masks, goggles and gloves. Do not burn any treated timber or use in composting or animal bedding.